Shredded: Off the Grid, panel 1, installation view at the Manhattan Midown Public Library windows..
Shredded: Off the Grid, panel 2, 2012. H74" x W22". Paper stitched on Organdi fabric. Shredded: Off the Grid, panel 1, 2012. H74" x W22". Paper stitched on Organdi fabric. Shredded: Off the Grid, panel 1, detail. Shredded: Off the Grid, panel 2, installation view at the Manhattan Midown Public Library windows..
"Faulkner’s Interferences 1, Absalom, Absalom", 2012. Collage on vintage book 1951 edition, H7.25” x W9.75”. Collection of the Muzeul Literaturii Romane Bucharest, Romania. 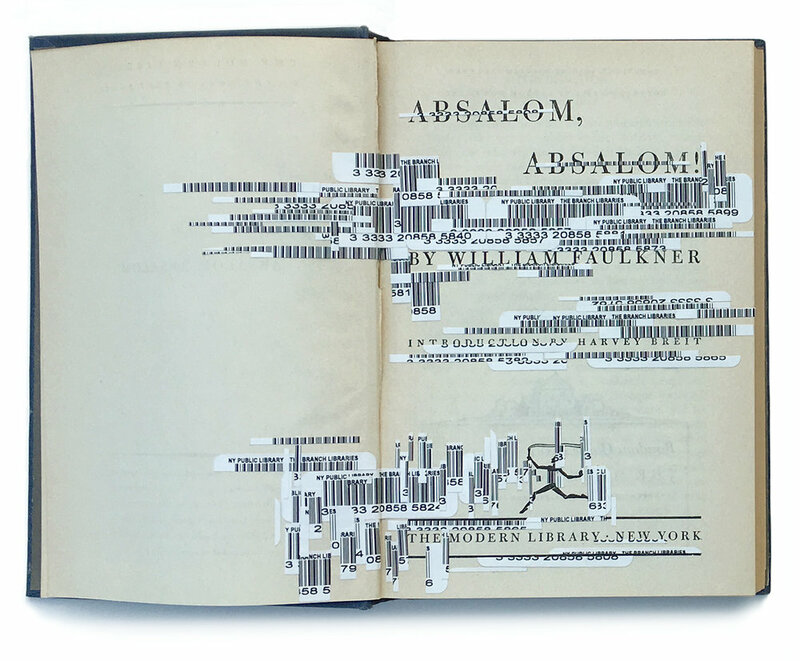 "Faulkner’s Interferences 1, Absalom, Absalom", detail. "Faulkner’s Interferences 2, As I Lay Dying", 2012. Collage on vintage book 1957 edition, H8.5” x W11.5”. Collection of the Muzeul Literaturii Romane Bucharest, Romania. "Faulkner’s Interferences 2, As I Lay Dying", detail.